(NationalSecurity.news) The Pentagon says that Russia is building an unmanned “drone” submarine that will be capable of delivering large-scale nuclear weapons against U.S. harbors and coastal cities, The Washington Free Beacon (WFB) reports. 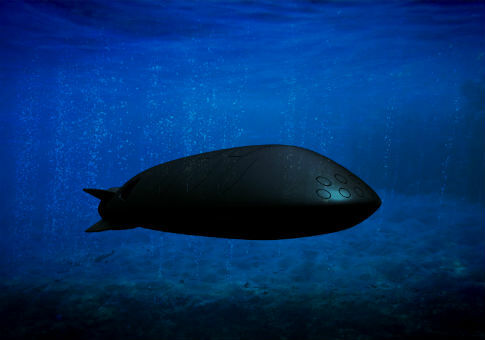 According to officials, the developmental unmanned underwater vehicle, or UUV, when it is deployed, will be outfitted with megaton-class nuclear warheads that can destroy key ports used by U.S. nuclear-armed and powered submarines like Kings Bay, Georgia, and Puget Sound in Washington state. The WFB noted that details surrounding the secret Russian drone sub are closely held within the U.S. government and intelligence community. The Pentagon has code-named the drone sub “Kanyon,” indicating that the sub is a structured arms program. According to the website, officials said the development of Kanyon is yet another indication of an aggressive nuclear forces modernization that has become a priority for Russian President Vladimir Putin. The development of the sub comes as President Barack Obama has sought to reduce the role that nuclear weapons play in U.S. defense, as well as rely on a much smaller nuclear force for deterrence. The WFB reported that officials familiar with the Kanyon program have said it will be capable of autonomous strike using a nuclear warhead that ranges in size to “tens” of megatons in yield. One megaton is equivalent to 1 million tons of TNT. When mounted on intercontinental ballistic missiles, megaton warheads are referred to as “city busters” that are designed to level entire metropolitan areas or to destroy buried targets. The drone sub’s weapons would be utilized to wipe out entire harbors and coastal regions, officials told the WFB on condition of anonymity due to the sensitivity of the information. “This is an unmanned sub that will have a high-speed and long-distance capability,” said one official, who noted that the drone development is years away from a prototype and testing. Kanyon appears to be part of Moscow’s efforts to modernize its strategic nuclear forces, in an effort to give Russia more leverage to coerce the U.S. or influence regional actors. The sub is also likely to complicate the Obama Administration’s desire to seek further reductions in nuclear arms between the U.S. and Russia following the 2010 New START arms reduction treaty. New cuts were delayed after Russia annexed the Crimea and intervened in eastern Ukraine, as well as Russia’s failure to return to complying with the 1987 Intermediate-Range Nuclear Forces Treaty. “It’s very difficult to consider Russia a responsible party when it’s developing something like this,” the official told the WFB. Currently, the U.S. is in the process of retiring all of its megaton nuclear weapons. Russia and China both retain megaton-level weapons. “The Kanyon represents another example of Russia’s aggressive and innovative approach to the development of military capabilities against U.S. and Western interests,” Jack Caravelli, a former CIA analyst who specialized in Soviet and Russian affairs, told the WFB.